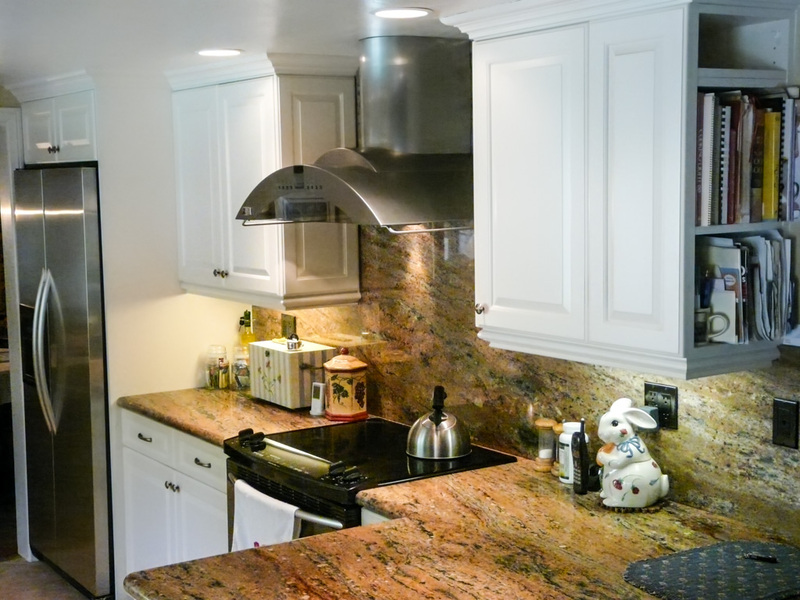 This client was referred to me by a family friend, as most of my clients are, and was looking to simply upgrade and replace all the existing kitchen components. 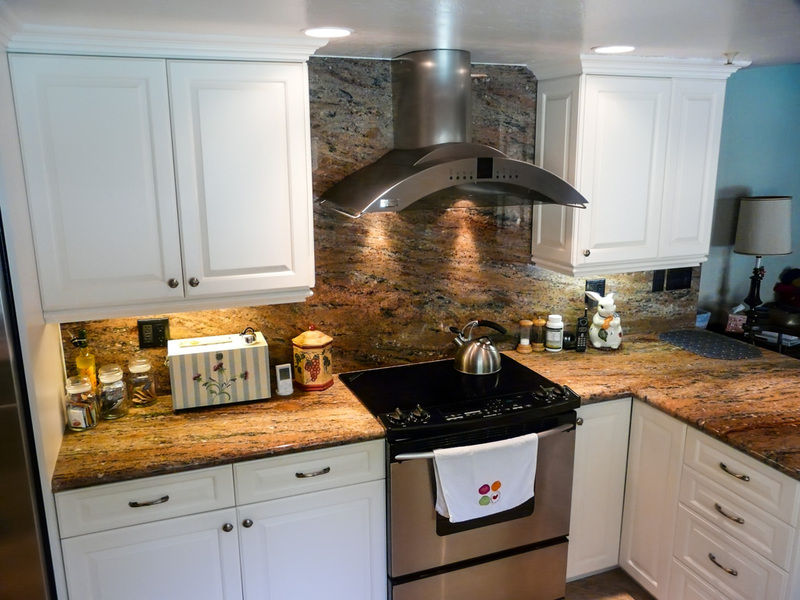 In regard to layout changes, the Wife could not imagine any modifications that could be made to make the kitchen more efficient. 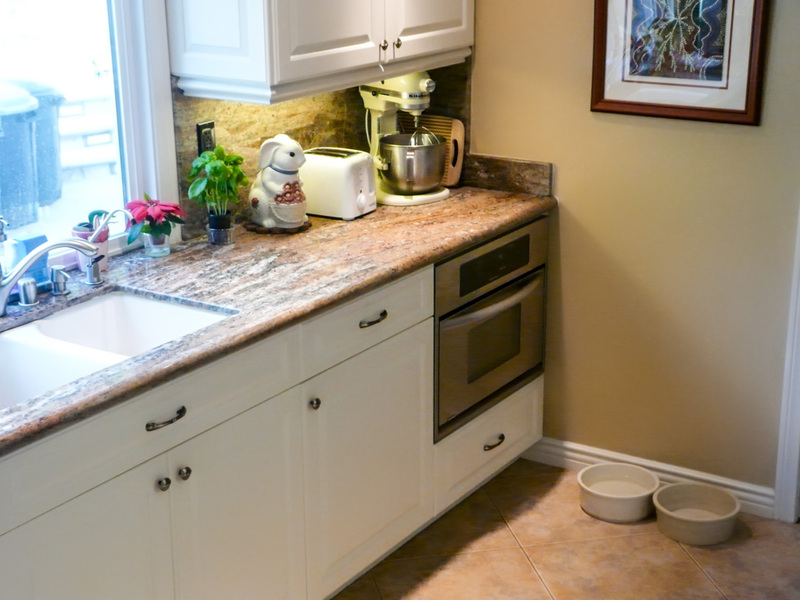 When I suggested considering a few minor placement changes for the sink, range, and fridge, she showed a great deal of resistance. 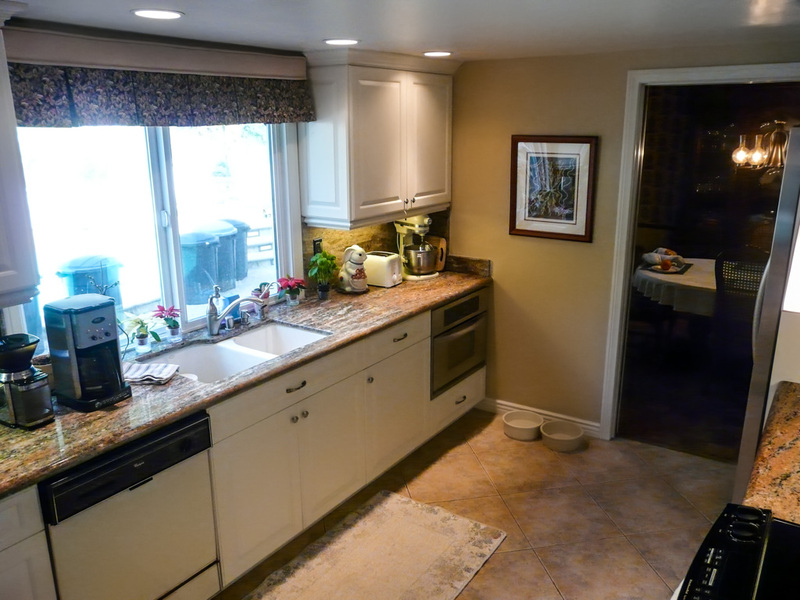 As I do with all of my clients, I explained why the changes would make the kitchen more usable in extensive detail to give her the necessary information and context to make an educated and informed decision, and asked her to simply think about it for a few days before she finalized her decision. 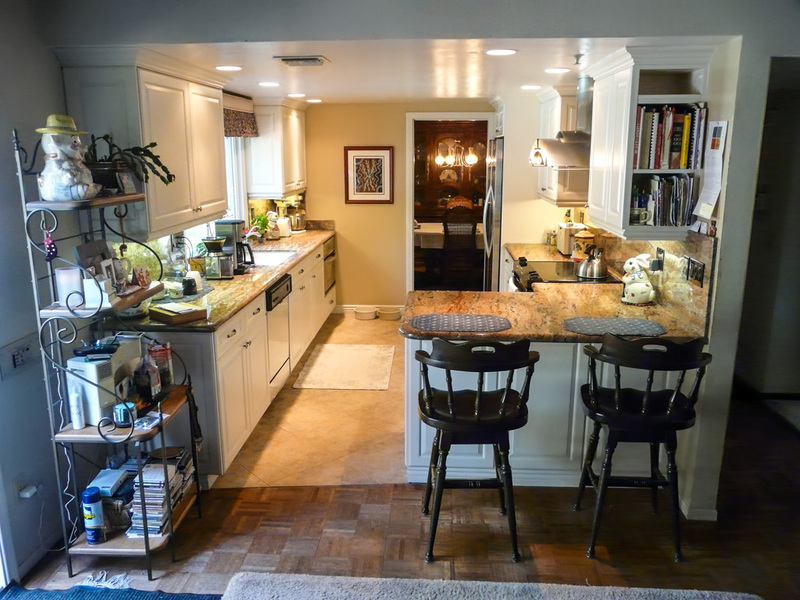 After talking to her grown children, one of which was a successful professional chef, she not only embraced the changes I had suggested, but added on other changes the family chef offered as well. To this day, whenever I see her she reminds me how much she likes the changes we made to her kitchen. 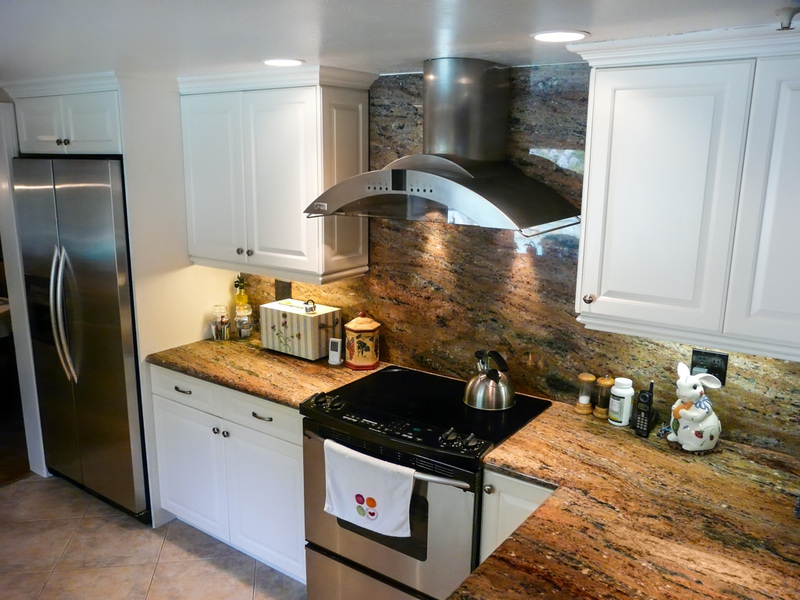 We have since done numerous other projects in her house, and for her friends and relatives. 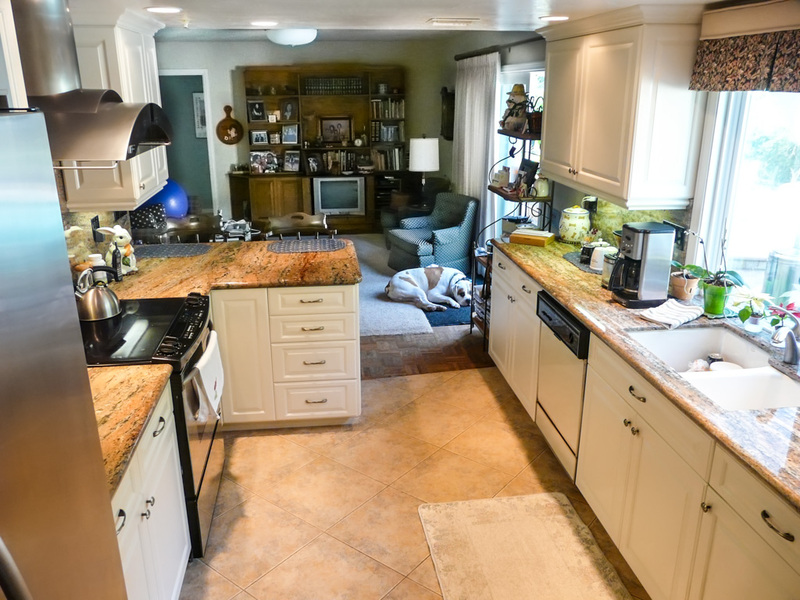 This is a pretty basic kitchen, all we did was try to ensure we created good counter workspace and storage near the primary kitchen work elements, the sink and cooktop. Our position changes were not drastic. 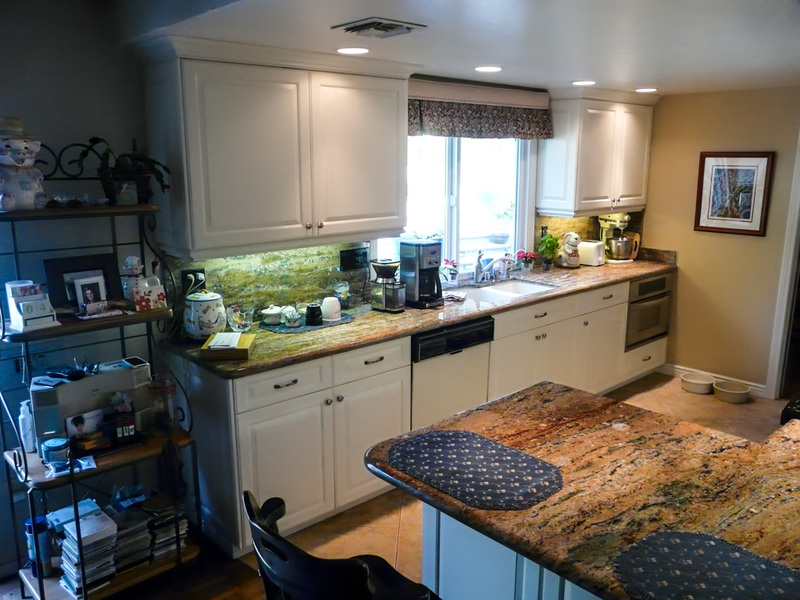 The client wanted the new kitchen to be light with a simple classic painted cabinet look. 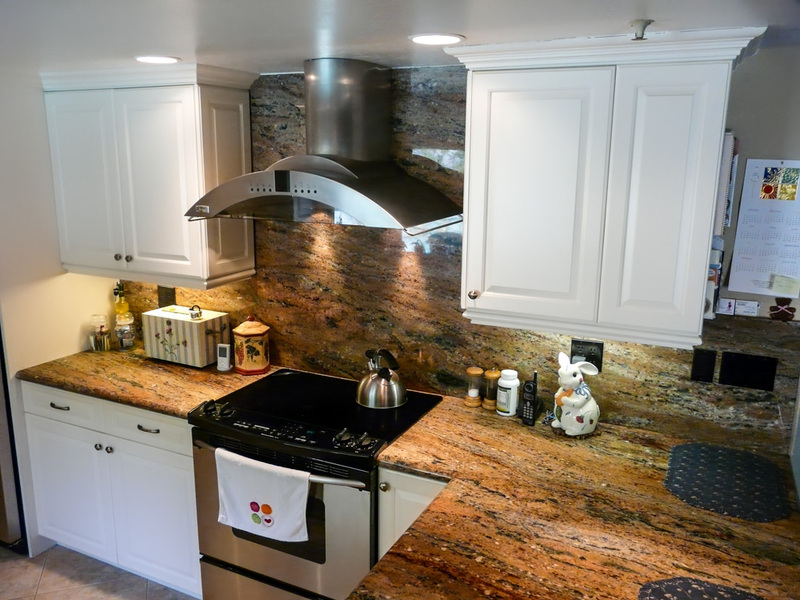 They found some very colorful granite slabs in a style called Creme Bordeaux that they fell in love with. 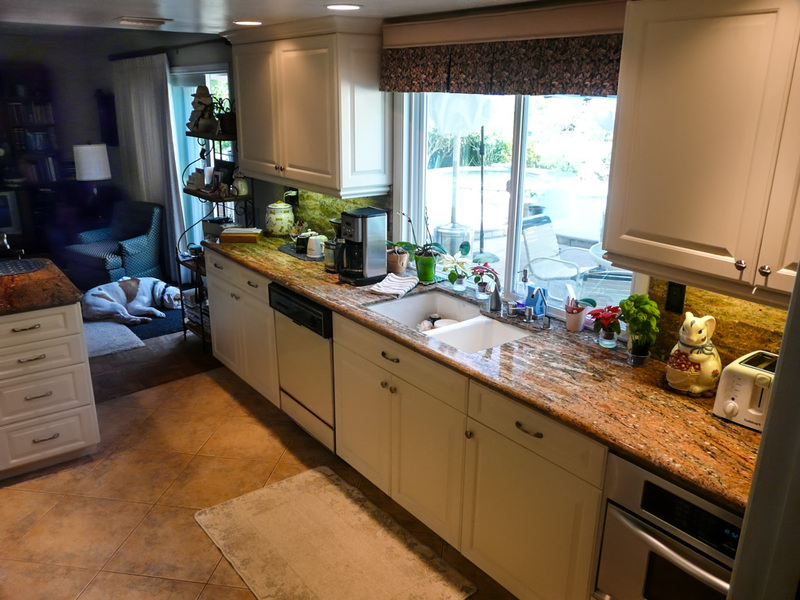 That stone is very dynamic with a lot of visual movement, “veining”, that the simple traditional white cabinets became a great way to get the neutral base needed to allow these countertops to really stand out as a point of visual focus in the room. They picked a 20 x 20 porcelain tile that looks like a natural honed stone for the floor that compliments the granite counters. Two years ago this client called to have us replace the halogen ceiling cans with LEDs. They really like the new LED cans, saying the lighting in the kitchen seems brighter than the old Halogens. 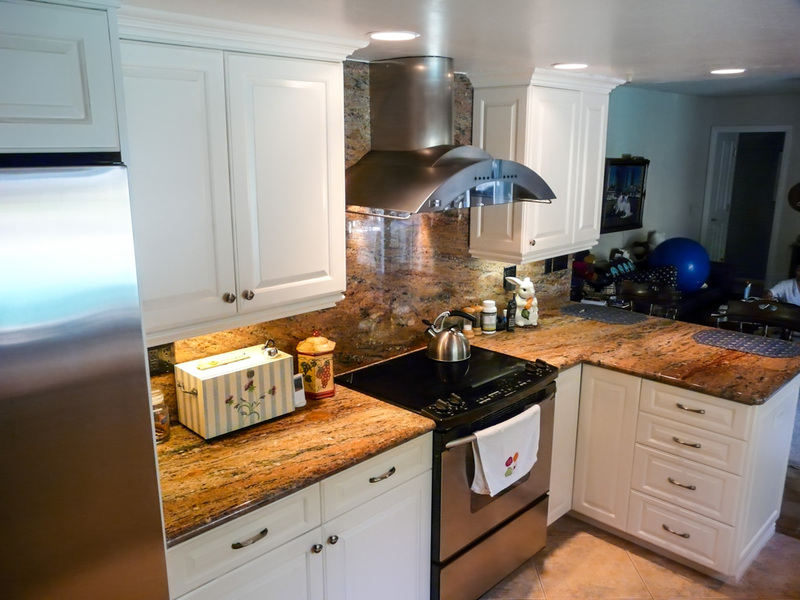 At that time, using LED under cabinet lights to replace the fluorescent was still cost prohibitive. 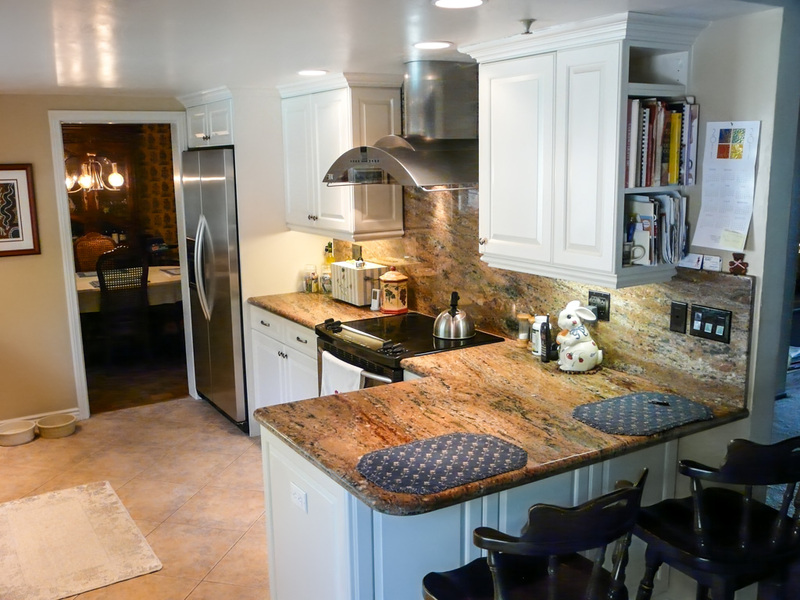 Today, as those costs are continuously coming down, changing out those lights will be the last thing they need to do to update this kitchen to present-day standards.